This sign does not mean what it says. …but what does it really mean? 5 comments to This sign does not mean what it says. Still not as funny as School Supplies | Liquor. 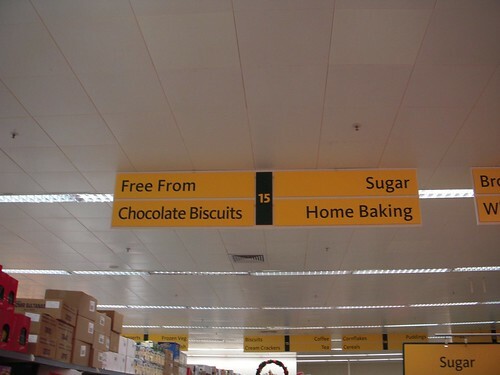 It clearly is trying to tell us that on aisle 15 you’ll find chocolate biscuits made without the use of a cookie cutter and therefore are of different shapes or free form. Thank you and please come again. I forgot why I didn’t use that address. An ogre’s picture appears that is most unfortunate, sorry. MT – No–that School Supplies | Liquor sign is a wonderful classic!